We should have 39 in stock. Need more? It usually takes us 7 - 10 days to bring more in. 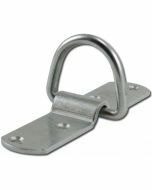 Used for a wide variety of applications, not rated for rigging or overhead use. While we call this a D Ring, it's also known as a D-Ring. 0.25" x 1.84" x 2.05"